Today I’m going to take you down memory lane and share my hair story with you, and how I decided to improve it with Dove Hair. In my high school days all the rave was “teasing” your hair. I would tease my hair so big its almost painful to look back on pictures. I wish I had a few to share with you, but those pictures are locked far far away never to be seen again. Aka, I think I threw them all away in fear someone would blackmail me with them. Then after high school I decided I should color my hair black with blonde streaks. Honestly, I think this was the worst of them all. I looked like Cruella De Vil. Then after my husband and I got married, I decided I wanted a drastic change. I dyed my hair platinum blonde and boy did I love it! Unfortunately, my hair did not. To this day I still suffer from damage because of that decision. My hair has grown 5x slower, I couldn’t seem to get rid of the brittle ends, and the orange tint after my hair fades never seemed to go away. Im almost to the point where the blonde has finally grown completely out, but it has taken YEARS! I finally decided to go back to my natural color and get my hair looking healthy again. I even chopped it this last summer and it felt so much healthier, and started to finally grow again! Now, six years later; my hair is starting to feel healthy again, and is regaining its shine and resilience. I’ve asked friends and tried the most expensive and high end shampoo and conditioners. Some I liked, but after a couple days it would leave my hair feeling gunky and dirty. Recently I decided it was time to go back to the basics and try the NEW Dove Regenerative Nourishment Collection found at Target. Ive always loved Dove products since High School, and frequently have them in my house. This collection left my hair feeling revived and silky smooth, and honestly looked and felt just as great as the high end hair products I normally use. The Regenerative Nourishment Serum Oil was my favorite part. It made my hair shiny and soft without looking greasy or weighing it down. Which for me is a big deal, considering I easily tend to gain too much product built up at my roots. I would definitely suggest this collection to anyone looking for beautiful hair without having to spend a fortune. 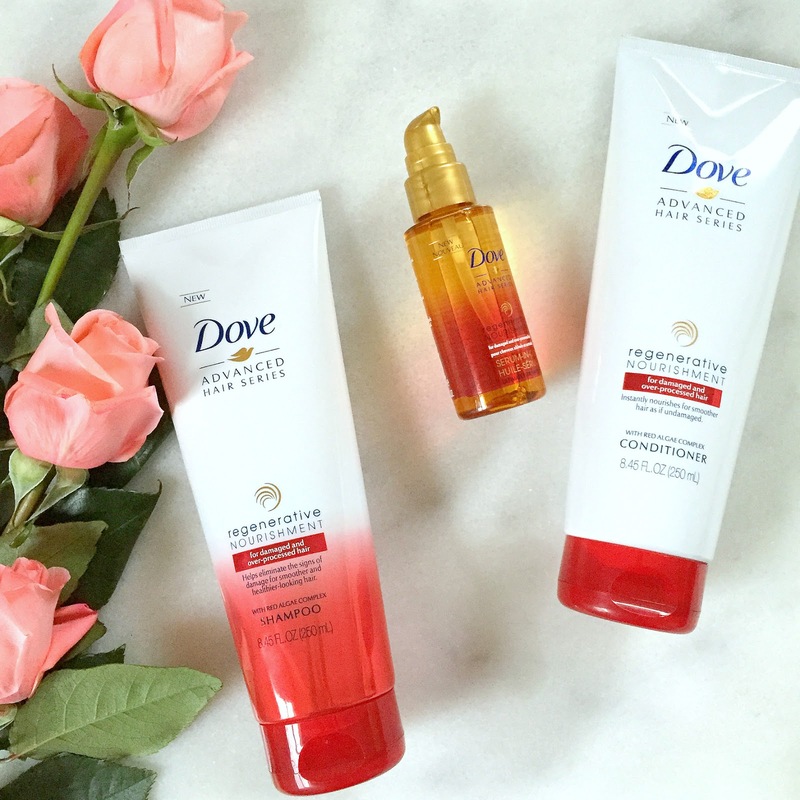 Next time you are at Target, grab the new Dove Regenerative Nourishment Shampoo, Conditioner and Serum in Oil Your hair will thank you for it! breastfeeding has murdered my hair I will have to give this a try! Thanks. First of all, your hair always looks amazing to me, but I know how it is when you see it and deal with it everyday. I have put my hair through a lot over the years, and tried so many products. I haven't tried these, but I LOVE Dove, so I will have to look into them! 🙂 Thanks for sharing. Oh and I love you as a blonde!! I'm four months postpartum and my hair is falling out like crazy right now, I have two almost bald spots. But it feels fairly soft and healthy and won't hold styles. Maybe this is what I need!